139 Passengers and Crew Drowned A terrible disaster is reported from Rotterdam. The Great Eastern Railway Company initiated a service from Harwich to Hook of Holland in 1893, when a railway line from Hook to Rotterdam was opened; with onward links to northern and eastern Europe. Great Eastern ordered three steamers from Earle’s Shipbuilding & Engineering Co Ltd, Hull, to operate the new service. The sisters were named Amsterdam, Berlin and Vienna, to publicise some of the rail connections from the Hook of Holland. The usual boat-train left Liverpool Street Station at 8.30 p.m. on Wednesday, arriving at Harwich at 10 p.m. The Berlin sailed shortly afterwards. All was well with her and a capital start was made. It was a rough night, but there was no fear for her safety. She was a splendid vessel, and had crossed many times on much worse nights than that. She was carrying a large number of passengers than usual for the time of year, this being accounted for by the booking of the German Opera Company who had been performing at Covent Garden. The “Berlin” left Parkeston Quay, at about 10 p.m. on the 20th February 1907 bound for the New Water Way, Hook of Holland, under the command of Captain Precious with 96 passengers, a crew of 52, all told, very little cargo, and 1.00 tons of coal in the bunkers. her draught of water was about 12 ft. forward and 15 ft. aft, and her freeboard below the upper deck would be 3 ft. 7 ins. The weather at the time the vessel left the port was very bad; a strong gale was blowing from the N.W., and some passengers who had booked passages decided at the last moment to remain behind. The “Berlin” proceeded to sea and had a very rough passage across the North Sea, but was well up to time when she passed the Maas Light Vessel, some 7 3/4 miles from the entrance to the New Water Way, Hook of Holland. Here it is customary for the Dutch pilot to take charge, but only to a qualified extent, as by Dutch law pilots are not allowed to take executive charge, but only show the masters, if necessary, the way into the harbour. Berlin was a steel ship of 1,775 tons; 302 feet 5 inches long, with a beam of 36 feet; twin screw, powered by two triple expansion steam engines producing 5,800 Ihp, giving her a speed of 15 knots. A great storm delayed her arrival and gave her a terrible crossing. She was only one hour late and within sight of safety when disaster struck. In this case the master and pilot were both on the bridge, and the pilot may be taken to have been assisting the master in the navigation. As the vessel approached the gas buoy, situated about three-quarters of a mile from the extreme end of the north breakwater, she encountered heavy breaking seas, causing her to roll very heavily, and shortly after she passed it, at a speed of 15 to 16 knots per hour, one sea struck her on the port quarter, causing her to broach to for some 5 points to the northward of her course. The helm was put hard-a-port, the starboard engines stopped and reversed full speed astern and the port engines kept full speed ahead. Under the action of her rudder and engines she was brought round with her head to the southwest, but whilst executing this manoeuvre she drifted, through the action of tide, wind, and sea, too close to the northern extremity of the breakwater to clear it, and before anything could be done she struck it with her port bilge” the first time not heavily” but the second time she impaled herself on its submerged extremity, from which all efforts to remove her proved futile. Whilst lying in this condition, with a heavy list to starboard, exposed to the full force of the north-west gale, the seas soon made a complete breach over her fore and aft. Proper discipline was maintained, and there was a remarkable absence of panic. The master remained on the bridge and gave the necessary orders, sent up rockets and blue lights, and directed the chief officer to clear away the boats. Whilst this was being attempted by part of the crew, heavy seas broke over the boat deck, smashing it up together with the boats and men, carrying the wreckage overboard and on to the heads of those passengers who were on the deck below. About this time the chief engineer reported the fires were drowned out, and that the engine room was filling with water. Shortly after, the bridge with the master and all who were with him were washed overboard. The passengers had all been summoned on deck and supplied with life-belts. Life lines for the passengers to hold on to were stretched along the deck where practicable, under the direction of the second officer, but from time to time many of them were swept off the exposed deck into the sea. The second officer was last seen in the act of going forward where several of the passengers had taken refuge. The Hook Lighthouse-Keeper recorded that Berlin was running well for mid channel and under proper control, when she suddenly veered off course. The ship had been struck on her port quarter by a huge wave, causing her to swing northwards. 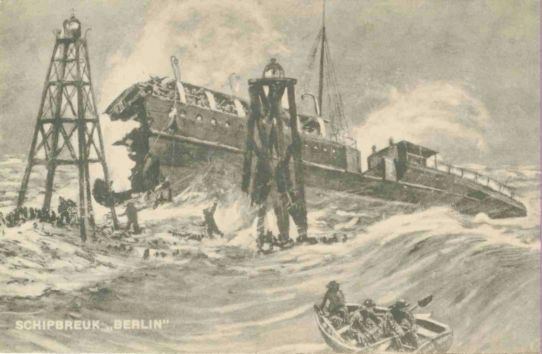 Captain Precious and Pilot Bronders struggled to regain control, but just as the ship’s head was coming back onto her original course, Berlin was struck again on her port quarter, by another heavy sea and was swung northwards, so that she was impaled on the very end of the granite breakwater at the entrance to the New Waterway. 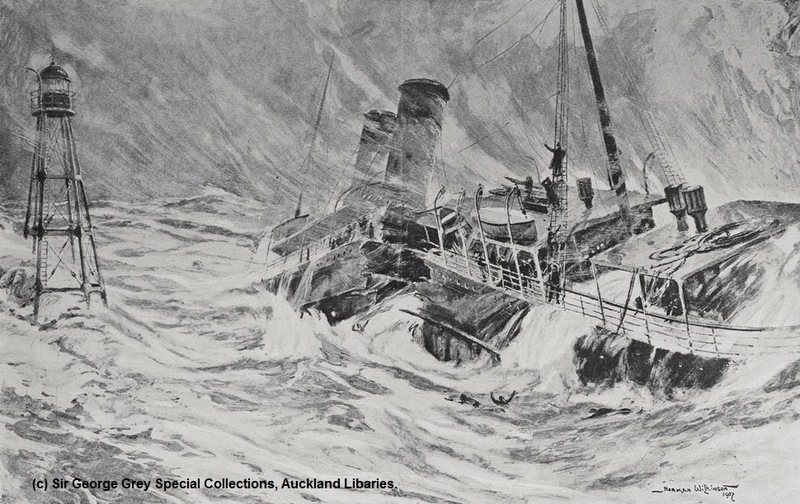 If the giant waves had struck while she was a few yards further out, Berlin would have entered harbour without harm, but instead she was wrecked within a few feet of safety. The seas swept over the entire ship. A passenger, Captain Parkinson, decided to offer Captain Precious help and advice, but just as he reached the bridge ladder, he saw both Captain Precious and Pilot Bronders swept overboard by tremendous wave. Between one and two hours after the stranding the vessel broke in half close to the steering engine house, the forward part falling into the Water Way and carrying with it to their death all the passengers and crew who were clinging to it. The after part remained impaled on the breakwater with about 25 passengers and 7 of the crew, all of whom had taken refuge under the partial shelter of the engine room skylight, where they remained huddled together all that day and the succeeding night, their number diminishing as the weaker ones were killed by exposure or were washed overboard. At 4 o’clock on the Friday afternoon, 11 of the survivors were rescued by the life-boat men, who passed a line from the breakwater to the vessel and dragged them into their boat. Three ladies who were too exhausted to descend on to the breakwater by these means remained on board till about 10 o’clock on the following morning, when they were rescued by Captain Sperling who climbed on board from the breakwater and lowered them down into his boat. The Dutch steam life-boat President van Heel, with a crew of nine men commanded by Captain Jensen, went out to assist. The weather conditions were deteriorating and it was only with the utmost difficulty that she could get out at all, but she succeeded at last in coming within three fathoms of Berlin. The seas lifted the lifeboat up and tossed her high above the wreck and disaster seemed certain until the captain succeeded in getting the boat’s anchor to hold. The lifeboat fired two rockets and the second established communication, but only for a few minutes, as the line fouled wreckage and was severed. Then the lifeboat’s anchor chain parted and she was forced to back away, to clear and return to the harbour for a fresh anchor and more rockets. At 06:00 Berlin broke in two amidships, abaft of the engine room. The fore part of the ship slid down the inner side of the breakwater, drifting for some 80 yards, before sinking with all those within. The after part remained firmly embedded on the piles and stones of the breakwater. The President van Heel went out again and at one point was within 10 yards of the wreck, but she could not get a line aboard. Later in the day she tried again, but only succeeded in rescuing Captain Parkinson, who managed to swim out to the lifeboat. On the following day she put out to the wreck three times, but still the sea was so tremendous that nothing could be done. Then at 13:30, she left the harbour in the teeth of a blinding snowstorm. Accompanying her was the pilot boat Helvoetsluis, with Prince Henry of the Netherlands aboard. 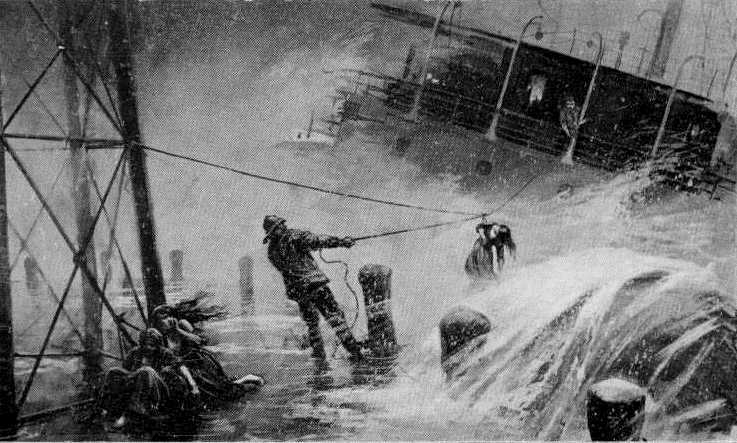 On approaching the wreck, Captain Jensen of the life-boat, with five volunteers from both the lifeboat and pilot boat, boarded a small boat and succeeded in landing at the end of the North Pier and ascend its iron beacon. From this vantage point, they were at last able to throw ropes to the deck of the wreck. These enabled 11 persons to be pulled to safety, joining their rescuers on the beacon. The 3 remaining women survivors on the ship were too terrified to follow. Despite the perilous conditions, the party on the beacon succeeded in regaining the pilot boat, after which the falling tide drove the rescue vessels back into the harbour. 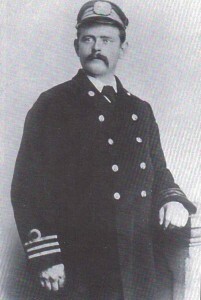 The Hero of the final rescue was Captain Sperling of the ss Josephine. seizing a quieter a time when the wind had fallen slightly he borrowed the tug Wodan. With his two nephews and two members of his crew he left at midnight. The captain plunged into the rough sea and made fast a rope to the beacon. Joined by one of his nephews the captain crawled along the breakwater to the iron tower. The lifeline was still in position. Captain Sperling then made the dangerous climb up the rope to the deck-rail. although numbed with cold he fastened a rope round the waist of one of three women found alive near a pile of dead bodies. carrying the helpless woman to the rail he lowered her down to his nephew. He in turn carried the woman to the tower and lashed her to one of the iron standards while he returned for the others. The last survivors were hauled aboard the boat and back to the Wodan with the greatest difficulty and danger. It was a feat of outstanding bravery and endurance in this tragedy of the sea. 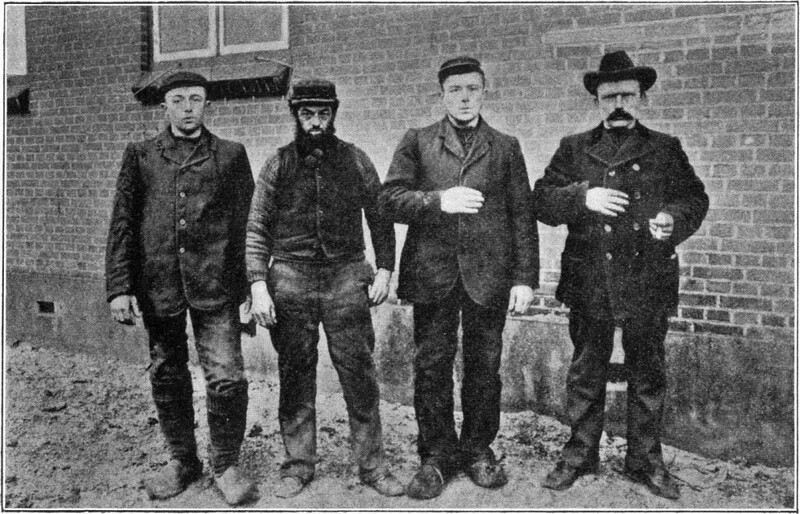 Lifeboat Skipper Martin Sperling was awarded a Silver Medal by the Lloyds Committee for his crew’s heroic efforts saving passengers, Skipper Martin Sperling (far right) is pictured with his men, brothers Lees [Leendert] & Kees [Cornelis] Sperling & Georg Moerkerk (second left). Noted for his thick brown moustache & quiet demeanour. Sperling is a short, square man with a calm face, heavily wrinkled forehead & a thick brown moustache; he has something morose about him but is not curt or angry’, noted a reporter. The heroic actions of the Dutch seaman resulted in the rescue of 15 people from Berlin – six women and four men passengers plus five crew. Sadly 128 people were drowned (48 crew and 80 passengers) within a short distance from the shore. 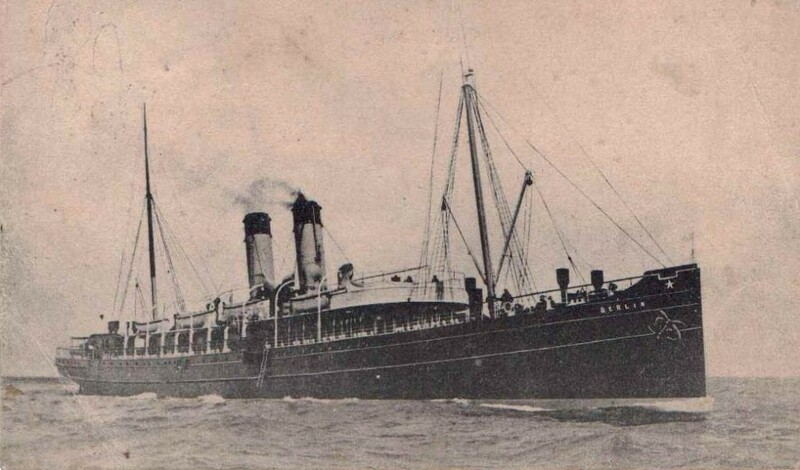 The master of the ss Clacton which left Harwich on the same night as the Berlin, saw the ship near the Hook. He was only 300 yards from the Berlin when his own ship was put five points of course by a tremendously heavy sea. The Clacton nearly shared the same fate as the Berlin. The master Captain William Dale eventually had to take his ship to sea for the safety of his passengers and crew. He was quite unable to give any assistance and it seemed impossible that there could be any survivors. On board the Clacton as seaman was the son of the master of the Berlin, Captain Precious. With the rest of the crew he saw the bridge of the Berlin swept away by 40-foot waves. He also saw batch after batch of passengers and crew swept into the waves and battered on the break-water. He helped to throw overboard all the lifebuoys which the Clacton held. Although first on the scene, both the master and the crew of the Clacton were helpless witnesses to disaster. One notable passenger on the vessel was Mr Herbert, a King’s Messenger travelling with diplomatic bags, including ones for Berlin, Copenhagen and Tehran. Included in the Tehran bag was the jewelled sword and decorations and all his other orders and ribbons including the insignia of the Knight Grand Commander of the Royal Victorian Order belonging to Prince ala-as-Saltanch. Although it is believed that Mr Herbert’s body was recovered on 16 March, the family asked for it to be treated as unidentified. The sword was recovered in early April. The correct number of persons on board the Berlin at that time was apparently not immediately known. Messages in English newspapers ranged from 128 to 180 persons on board. It is now known that 128 of 144 persons on board were killed, including about forty crew members. At the formal inquiry at Caxton hall, the loss of the s.s Berlin was put down to an error of judgement during an exceptional North West gale, not allowing for the new waterway and exceptional NW gale, not allowing for the strength of the wind and tide. Part of the insurance money was donated by the Great Eastern Railway to St.Gabriels, Church, Parkeston to move, rebuild and renovate the organ at the new church of St .Paul’s in memory of those who lost their lives. In command was captain precious,the senior Captain of the fleet, an old servant whom had risen through the ranks during his 26 years with the Great Eastern Railway company. He could only account for the weather being the cause of the disaster, a terrific gale was blowing at the time. He leaves a wife and several children, all of whom except are grown up. Two are in the employ of the G.E.R. at Parkeston, and a daughter is in a G.E.R. refreshment room at Ipswich. He also leaves an aged father and mother, who live at Harwich, the father being a pensioned Customs officer. A man of wonderful nerve, Capt. Precious was equalled by few for coolness and judgement in a fog or moments of danger. He served on several of the other seven boats belonging to the Company, and was widely known and highly esteemed. Mr Busk, the manager of the G.E.R. Continental Department, told a Chronicle representative that Capt. Precious was a most able man, and the Company had the greatest confidence in him. The Body of Captain Precious was found washed ashore, 17 miles from the scene of the disaster in a “good state of preservation”. The body was returned on the Amsterdam in a Dutch coffin and taken to Parkeston mortuary and laid to rest in Dovercourt churchyard, 6 able seamen from the “Dresden” acted as pall bearers. “Mrs John Precious and Family wish to Thank the many Friends for the kind sympathy shown to them in their painful and sudden bereavement through the disaster to the S.S. “Berlin”, in the death of their Husband and Father. John Precious. 1862-1907. captain, Main Road, Dovercourt. Mrs John Precious and family wish to thank the many friends for the kind sympathy shown to them in their painful and sudden bereavement through the disaster to the ss Berlin”, in the death of their Husband and Father. Clarence Frederick Morsley. 1870-1907. chief mate, Manor Road, Dovercourt. Mrs Morsley and family, also Mrs G. Crosby and family are most grateful to all kind friends for much sympathy shown them in their sudden bereavements. Mrs Morsley desires to thank the G.E.R. officials who have been most kind”. James T Wyatt. 1873-1907. second mate, Gwynne Road, Dovercourt. Mrs J.T. Wyatt and family wish to express their sincere thanks for the generous and deep sympathy shown to them in their sad bereavement, by the numberless friends from all parts and at home. Not picked up. Peace, perfect peace. William James Dennant. 1857-1907 1st engineer, Station Road, Dovercourt. R W Kendall. 2nd engineer, Cliff Road, Dovercourt. Mrs R.W. 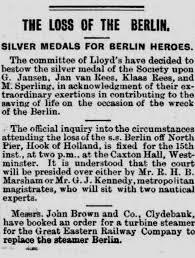 Kendall and family desire to thank the many friends for their kind sympathy in their sad bereavement through the disaster to the ss Berlin at the Hook of Holland. W Gregory. 3rd engineer, Waddesdon Road, Dovercourt. In Memory of Gregory who lost his life in the wreck of ss Berlin at the Hook of Holland. In Memory of Charles Mills who lost his life in the wreck of ss Berlin at the Hook of Holland. Samuel James Ellis. 1861-1907. carpenter, Maria Street, Harwich. Mrs S. Ellis and family desire to thank the many friends for their kindness shown to them in their sad bereavement through the disaster to the ss Berlin in the death of a beloved husband and father Samuel Ellis who lost his life off the Hook of Holland on February 21st 1907. James Harvey. A.B., Bathside, Harwich. Mrs J Harvey and relatives wish to thank the many kind friends for their kind sympathy shewn to her in her sad and sudden bereavement, by the loss of her dear Husband, who lost his life in the wreck of the ss Berlin at the Hook of Holland. N Rayment. A.B., Golden Lion Lane, Harwich. Mrs R. Rayment wishes to thank all those kind friends who sympathised with her in her great trouble and sudden bereavement by the loss of her dear husband, in the foundering of the ss Berlin at the Hook of Holland, on Feb. 21st 1907. Arthur Pells. 1874-1907. A.B., Canon Street, Bathside, Harwich. Mr R. Pells and family wish to thank all who sympathised with them in their sad bereavement and trouble, and the loss of Arthur Pells who was drowned in the G.E.R. steamer “Berlin” at the Hook of Holland. Thomas Gosling Gould. A.B., Canon Street, Bathside, Harwich. Mrs T.G. Gould and family wish to return sincere thanks for kindness and sympathy shown them in their sad and sudden bereavement by the loss of dear husband and father, Thomas Gosling Gould, A.B. on the ss Berlin wrecked 21st February 1907. George Easter. A.B., Wellington Road, Harwich. Mr. and Mrs. A. Easter and family wish to thank the many friends for their kind sympathy in their bereavement by death of their beloved son and Brother who lost his life in the wreck of the ss “Berlin” at the Hook of Holland. Harry A. Samkin. 1877-1907. A.B., Tyler Street, Harwich. Mrs P. Samkin desires to thank the friends who have so kindly sympathised with her in her sad bereavement in the loss of her dear husband Harry A. Samkin, through the loss of the ss Berlin; also to acknowledge the kindness of the G.E.R. officials, for which she is very grateful. A Britton. A.B., Victoria Terrace, Dovercourt. T Harper. O.S., Victoria Terrace, Dovercourt. In Memory of T. Harper who lost his life in the wreck of ss Berlin at the Hook of Holland. H Fisher. O.S. , Adelaide Street, Parkeston. James Farthing. 1892-1907. deck boy, Hamilton Street, Parkeston. In Memory of James Farthing who lost his life in the wreck of ss Berlin at the Hook of Holland, February 1907. Charles William David Gibbons. deck boy, Victoria Terrace, Dovercourt. Mrs Olsen and family wish to thank their many friends who so kindly helped and sympathised with them in their sad bereavement in the death of her dear Son, Charles Gibbons, who died on the wreck of the Berlin; also to thank the G.E.R. Company and Officials for their great kindness. Henry Carliell. 1865-1907. donkey man, West Street, Harwich. In memory of Henry Carliell aged 42 in the foundering of the ss Berlin at the Hook of Holland, on Feb. 21st 1907. Benjamin Catchpole. 18601-907. fireman, Hordle Street, Dovercourt. Mrs B. Catchpole and Little Ones wish to thank the many friends and Neighbours for their help and sympathy in their sad and sudden bereavement through the disaster to the ss Berlin; also the G.E.R. Officials for bringing the remains of our dear one home, and who have done all that is possible, and we tender our heartfelt gratitude. Arthur Waters. 1877-1907. fireman, Myrtle Terrace, Bathside. On February 21st 1907 Arthur Waters, the beloved husband of Grace Waters, who lost his life in the wreck of ss Berlin at the Hook of Holland, aged 30 years. Not picked up. John Gilbert. 1859-1907. fireman, Mill Lane, Dovercourt. Mrs Gilbert and Family desire to thank all kind friends for the sympathy shown in their sad bereavement. David Frederick Smith.1882-1907. fireman, Victoria Street, Dovercourt. Mrs. Smith, widow of David Frederick Smith, wishes to express her sincere thanks for the kind sympathy shown to her in her great bereavement by the loss of her dear husband, by the recent disaster to the ss Berlin off Hook of Holland; also in particular thank the officials of the Great Eastern Company, all of whom have been very kind”. A Pond. fireman, Victoria Road, Harwich. In Memory of A. Pond who lost his life in the wreck of ss Berlin at the Hook of Holland. J Rouse. fireman, Princes Street, Parkeston. In Memory of J. Rouse who lost his life in the wreck of ss Berlin at the Hook of Holland. Frederick John Moss Gibson. 1866-1907. fireman, Victoria Street Dovercourt. Mrs. F. Gibson, family and relatives wish to thank the many friends for kind sympathy shown to them in their painful and sudden bereavement, through the disaster to the ss Berlin, in the death of their husband, father and son; also to thank the officials of the Great Eastern Company for their kindness through all their trouble. J Ryecroft. fireman, Canning Street, Bathside, Harwich. In Memory of J. Ryecroft who lost his life in the wreck of ss Berlin at the Hook of Holland. George Watts. Syrett. 1884-1907. fireman, Maria Street, Harwich. A Coppin. fireman, Martin Road, Ipswich. In Memory of A. Coppin who lost his life in the wreck of ss Berlin at the Hook of Holland. John Jackson Gostling. 1869-1907. fireman, Butler Terrace, Wrabness. In Memory of John Jackson Gostling who lost his life in the wreck of ss Berlin at the Hook of Holland. A Howlett. fireman, Hamilton House, Parkeston. In Memory of A. Howlett who lost his life in the wreck of ss Berlin at the Hook of Holland. H Robinson. fireman, Mistley Heath, Manningtree. In Memory of H. Robinson who lost his life in the wreck of ss Berlin at the Hook of Holland. Albert James Chapman. fireman, Pepys Street, Harwich. Mrs A. J. Chapman, widow of Albert James Chapman, personally known as “Jim”, wishes to thank all those kind friends who sympathised with her in sudden great bereavement by the loss of her dear husband, in the foundering of the ss Berlin at the Hook of Holland, on Feb 21st, 1907; also thank the officials of the Great Eastern Company for their extreme kindness”. William Moor. 1866-1907. chief steward, Cliff Road, Dovercourt. Mrs W.J. Moor and family wish to express their sincere thanks to for the generous and deep sympathy shown to them in their irreparable bereavement by the numberless friends from parts at home, and from aboard. Joseph Kedgley.1866-1907. second steward, Victoria Street, Dovercourt. In Memory of Joseph Kedgley who lost his life in the wreck of ss Berlin at the Hook of Holland. George Thomas Bullock. 1876-1907. head saloon steward, Nelson Road, Dovercourt. Alfred E Cooper. 1876-1907. second cabin steward, Gwynne Road, Dovercourt. Mrs. Cooper desires to thank the many friends for kind sympathy shown to her in her sad and sudden bereavement in the loss of her dear husband, Alfred E. Cooper, through the disaster to the ss Berlin at the Hook of Holland; also to thank the Great Eastern Railway Company & officials, and express her grateful appreciation. W Carter. salon steward, Main Road, Dovercourt. In Memory of W. Cartert who lost his life in the wreck of ss Berlin at the Hook of Holland. Ernest Edward Salter. 1875-1907. Saloon steward, Maria Street, Harwich. Mr and Mrs R.J. Salter wish to express their sincere thanks to all those kind friends who sent such beautiful wreaths, and for such sympathy shown in their sad and sudden bereavement in the loss of their dear Son, Ernest Edward, through the disaster to ss Berlin at the Hook of Holland. He only sleepeth. J E Keen. assistant steward, Lee Road, Dovercourt. Mr & Mrs Keen and Family wish to thank their many friends who kindly help and sympathised with them in their sad bereavement in the death of their dear son, who was drowned on the “Berlin”, thanking the G.E.R. Company and officials for their great kindness. Also for the beautiful wreaths sent. Albert Edward Durrant. 1883-1907. assistant steward, Vansittart Street, Harwich. Mr. and Mrs. Durrant & Family wish to express their sincere gratitude to the many friends who have shown sympathy with them in the loss of their dear Son and Brother, through the Berlin disaster. In memory of son Albert Edward Durrant. Frederick Mead. 1888-1907. Assistant steward, Little Church Street, Harwich. Mr. & Mrs. Mead wish to express their sincere Thanks to all those kind Friends who sent beautiful wreaths, and for the sympathy shown in their sad and sudden bereavement in the loss of their dear Son, Fred Mead, who was a victim in the Berlin disaster. Rest in Peace. W Wilding. pantry boy, Hamilton Street, Parkeston. In Memory of W. Wilding who lost his life in the wreck of ss Berlin at the Hook of Holland. T Bulman. cook, Nelson Road, Dovercourt. In Memory of T. Bulman who lost his life in the wreck of ss Berlin at the Hook of Holland. Morry Puttock. 1887-1907. cook’s assistant, Coke Street, Harwich. In ever loving remembrance of Morry the dearly beloved son of Morris and Maude Alice Puttock who lost his life in the Berlin disaster. Say not good night but in some other clime bid, me good morn. Emily Eliza Bulman. 1855-1907. Stewardess, Widow, Nelson Road, Dovercourt. Mrs Groves and S. Bulman and family beg to return heartfelt thanks to all kind friends, and the members of the R.A.O.B. who kindly condoled and sent wreaths in memory of their dear mother and brother, Mrs T.Bulman and T.Bulman. It is regretted that through some misunderstanding certain wreaths were placed in the grave, and so destroyed. Miss Brown. Stewardess, Garland Road, Parkeston. Mr. and Mrs. Rudland and family beg to thank their many friends for their kind help and sympathy in connection with their sad bereavement in the loss of Miss Brown, Stewardess on the Berlin. They particularly wish to thank the G.E.R. officials for the considerate arrangements made, also for many beautiful wreaths. Miss Mallows. extra stewardess, Fernlea Road, Harwich. In Memory of Miss Mallows who lost her life in the wreck of ss Berlin at the Hook of Holland. Mrs Ellis. second cabin stewardess, widow with three children, Hordle Street, Dovercourt. In Memory of Mrs Ellis who lost her life in the wreck of ss Berlin at the Hook of Holland. Wrecked OFF THE Hook of Holland WITH THE Loss of 128 Souls, February 21ST, 1907. Hark to the death-bell tolling! In the Mail Boat, the ss. Berlin. We heard the whistle give one loud, long blast. Never dreaming what would be the last. And the lights of the pier were in view. T’was the Steward’s loud Bugle Alarm. The Berlin had parted in two. Serve out lifebelts, rang out the command. Loosen boat covers, next came the order. And each seamen went to his stand. “Oh, my God! “ he sadly exclaimed. 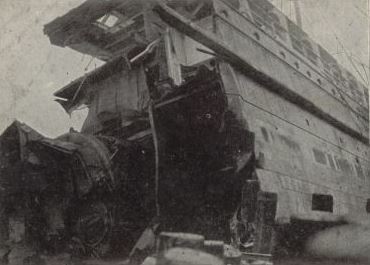 Til swept from the wreck by the blast. A piteous sight to behold. Unable to cling to the wreck. Their poor benumbed limbs must be blue. The only five left of that crew. And they thing of that dreaded watery grave. To reach those poor souls on the wreckage. Brave men, none thought to shore. And are numbered at last with the dead. And the care of the dead which they took. And has won the heart’s praise of his Queen. And is protecting the forms of the dead. And with bowed head did silently weep. Though dead, smiling still as in sleep. All of them lived around here. All lost mid’st the hurricane’s roar. And all our efforts the Master will bless. Many communities so attached to and reliant upon the sea, experience the grief of disasters; February 1907 brought this grief home to the people of Dovercourt, Harwich and Parkeston. Scarcely a street was not affected and for many days the sad little funeral processions wended their way through the town with shuttered windows and Half-mast flags, and grown men weeping openly in the street. Marcus Bateman for supplying some of the material on this site. His 2nd Great Father Benjamin Catchpole was drowned on the Great Eastern Railway steamship SS Berlin in 1907 off the Hook of Holland.